Clevis Hooks are a hooks with or without a snapping lock or pin to secure it’s load to the hook. Clevis Hooks can be attached with brackets or a chain depending on the type of Clevis hook. Clevis fastening system utilizes a quick change “clevis pin” which is a type of bolt that is held in place with a cotter pin or split pin. The Clevis hook can be attached to a chain or crane or winch bracket using the Clevis pin. Depending on the application, Clevis Hooks have a particular function and limitations. There are a variety of sizes of Clevis Hooks, each with a different maximum work load limit and grade. 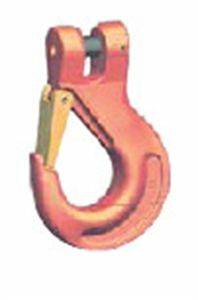 The grade of a Clevis Hook reflects the type of use the hook is recommended for. For example, grades 63, 80, and 100 are categorized as overhead lifting Clevis Hooks. Likewise, Clevis Hooks with grades 30, 43, and 70 are not rated for overhead lifting, more for securing loads or towing purposes. As you can see, there is a particular Clevis Hook for every type of lifting, pulling, or securing job. Horizon Cable can match your project with the right Clevis Hook. If you have any questions or would like more information on Clevis Hooks from Horizon Cable, please call us today at 866.369.9507. You can also request a printed copy of our full catalog or download a digital copy here.